The Blues improved to 5-0-1 in their last six games against the Rangers in New York. NEW YORK — While growing up in New Rochelle, N.Y., Kevin Shattenkirk watched Rangers defenseman Brian Leetch score many big goals. Given a chance to do the same at Madison Square Garden, the St. Louis Blues blue-liner made the most of his opportunity. Shattenkirk fired in the tiebreaking power-play goal early in the third period, and the Blues got the best of New York again in a 2-1 victory Thursday night. "There were a lot of emotions going through my body, but after the first couple of shifts it just felt like a hockey game again," Shattenkirk said. "Once the goal happened, even more of a relief. I was happy and you could hear some people cheering." Shattenkirk had his own rooting section. He secured 20 tickets himself, but estimated that 60 or 70 people he knows got tickets on their own to watch him play. He could hear them when he one-timed a pass from Alex Pietrangelo through a screen and past goalie Henrik Lundqvist — a la Leetch — at 3:09 for his eighth goal of the season. "There are a lot of things that I watched in him growing up, and he was a very special player. I try to emulate him as best as I can," Shattenkirk said. "Those were areas that he always shined in." Alexander Steen also had a goal for the Blues before leaving late in the second period with a lower-body injury. David Backes had two assists, and Jaroslav Halak made 34 saves in beating Lundqvist in a matchup of Olympic goalies. New York’s Rick Nash scored his sixth goal in four games — netting at least one in each — but Shattenkirk took advantage of Nash’s slashing penalty, scoring 9 seconds into the power play. Lundqvist made 23 saves in his return from a one-game absence caused by the flu. He allowed fewer than three goals for the seventh straight game, but still couldn’t find a way to stop the Blues — the only NHL team he has never beaten (0-4). "I was moving the way I wanted to," Lundqvist said. "I am happy with the way I played, but it’s still very disappointing to not come out of here with at least one point." St. Louis, which killed all three Rangers power plays, swept the two-game season series and has won seven of the past eight meetings. 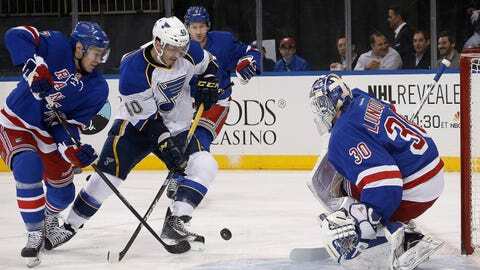 The Blues, beaten 7-1 at New Jersey on Tuesday, have earned points in eight straight visits to Madison Square Garden. This was their first since Nov. 7, 2010. "It’s shameful that we haven’t been here more often," Backes said. "You see the crowd, you’re in the city for a day or two, you feel that hype, and you know what playing the New York Rangers brings. I think it brought the best out of us." The Rangers got even late in the second on Nash’s team-leading 17th goal. Derek Stepan sent a pass from behind the net to Nash, who stepped into a slap shot from the dot in the left circle and ripped a drive past Halak with 1:43 left. New York pressured the Blues for the remainder of the period and drew its second power play in the closing seconds. "We had a couple good looks," Rangers captain Ryan Callahan said, "a couple Grade-A chances there right in front. We just didn’t get one past them there." The Rangers outshot the Blues 28-18 through 40 minutes. "They’re a team that if we would’ve taken off the gas for 60 seconds, it could’ve been 3-2 the other way in a heartbeat," Backes said. Steen gave the Blues a 1-0 lead with his 26th goal. A pass from Jaden Schwartz hit Steen’s right skate in front of the crease, caromed off Lundqvist’s stick and skate and trickled in at 8:38. The goal was briefly reviewed by video replay, and it was determined that the puck wasn’t kicked into the net. It was the fifth straight goal allowed by the Rangers since they had a 3-1 lead over the Islanders in the second period on Tuesday in a 5-3 loss. A late power-play goal was the winner in that one, too. Steen struggled to get to the bench after going hard into the boards in the second, but he was back soon after on the power play. He skated off for good with 2:57 left in the period. Blues coach Ken Hitchcock said Steen is day to day. NOTES: Nash has 21 goals and 40 points in 50 games versus the Blues. … Steen has 14 career points against the Rangers and 12 in the past seven games – including six goals. … Schwartz played in his 100th NHL game. … Blues C Maxim Lapierre was activated from the injured list after missing five games due to a lower body injury. … Newly acquired D Kevin Klein made his Rangers debut. … St. Louis C Derek Roy was a healthy scratch.